With Christmas fast approaching, I thought it would be fun to create a series on a Planner Babe’s Christmas Gift Guide. Do you have a planner babe in your life, but you aren’t sure what to ask for? 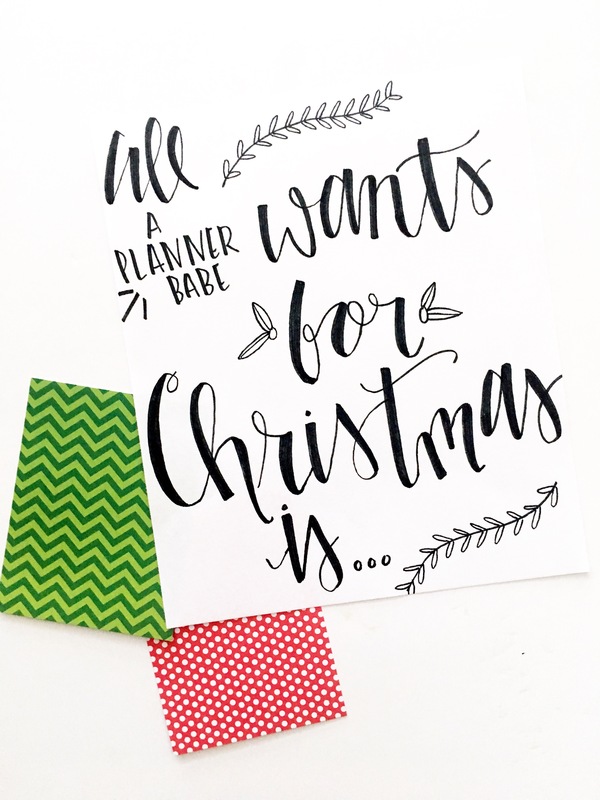 Or maybe you ARE a planner babe, and people keep asking you what you want for Christmas? Over the next few days and weeks, I will be writing about different items that would be on any planner babe’s dream Christmas List! The first item on any planner babe’s list is a good pen for their planner. I get asked all the time what kind of pens I use in my planner, so the below pens are the ones that I use in my planners! The first pen on my list are the mambi pens! These pens come in packs of four and can be found on the mambi shop or at Hobby Lobby. They come in packs of four, and they all are black ink. There is a set of black pens and a set of colorful pens, but even the colorful pens write in black ink. They retail at $4.99 a pack, which makes them $1.25 a piece. I love these pens because they are a super fine tip. It is easy to write in smaller, thinner details. The next set of pens that I love using are the Fine Liner Pen Set by Recollections. These pens come in a pack of 20 and can be found at Michaels. Each pen writes in a different color, so it comes with 20 different inks. They retail at $4.99 for the entire pack, which makes them about $.24 each! I love these pens because they are also super fine tip and are great for writing the smaller details in. They write very similar to the mambi pens, but come in lots of colors! The next pens on the Christmas List are the Papermate Inkjoy Gel pens. These pens come in a pack of 14 pens and can be found at Target, Walmart, Office Depot, Staples, etc. Each pen writes in a different color. They retail at $19.99 for the pack, which makes each pen $1.42. They have a .7 tip so they write a little thicker than the other pens I’ve written about. People love these pens because they write smoothly and they don’t smudge. I’m not crazy about them because I don’t like the tip that much, but other planner babes rave about them! 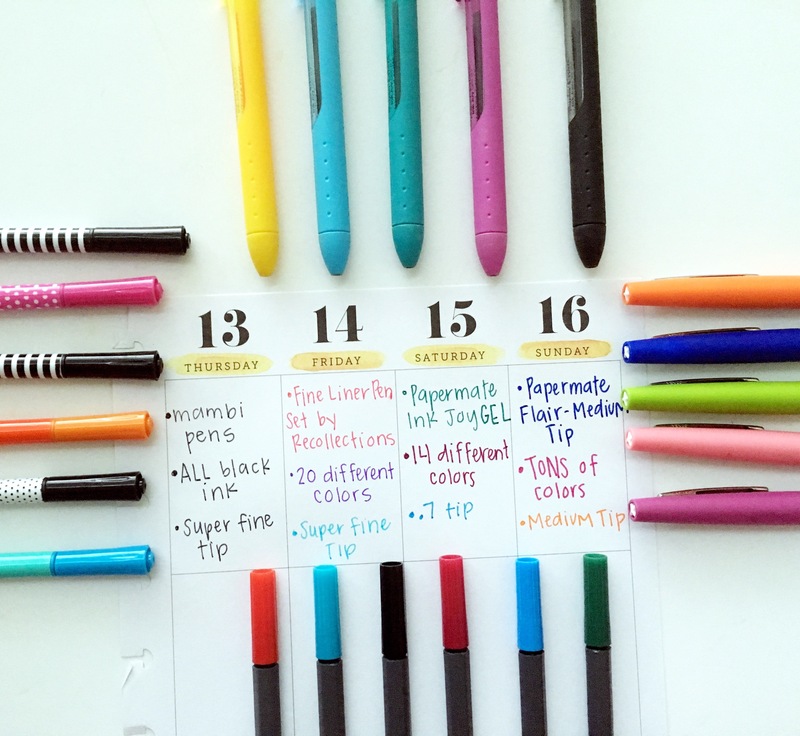 Last on my list of pens for the planner babe on your list are the Papermate Flair pens. These pens are my *FAVORITE* pens. I use them on a daily basis in my planners. There are actually several different packs that you could purchase of these pens, and the packs have different colors in them. I honestly have no idea how many different colors these pens come in! The pack I linked is a pack of 16 that retails for $28.99. That makes the pens around $1.81 each. However, these pens are normally cheaper on Amazon and most stores will price match, so I suggest buying them that way! So that’s an overview of the four different pens that I use the most in my planners. If you give any of these pens to the planner babe on your list, I can assure you that they will love them! Check back in a few days for part two of this series on a Planner Babe’s Christmas Gift Guide! Happy planning! Yes! I love the .5 tip, the .7 are just okay! The Papermate flairs are my absolute favourite, but I am on the hunt for a new favourite black ink ‘everyday’ pen. I haven’t seen the MAMBI ones around here and the Staedler ones make my hand hurt (I think it has something to do with their shape/size), I’ll have to check out the Ink Joy Gels. I’ve used regular ink joys but I’ve seen lots of recommendations for the gel ones lately!